At the moment I have 430 Euro in bids in open market listings and 394 Euro cash available. Currently Isepankur shows my ROI to be over 27.8%. In my own calculations, using XIRR in Excel, I currently get a 25.5% ROI. Assuming that 30% of my 60+days overdue and 15% of my overdue loans will not be recovered my ROI still calculates to 22.1% . What happened in the past 3 months since my last blog post? During the summer I was not very active in managing my Bondora investment. I let my automatic profiles (they are now called Portfolio Manager) run and occasionally manually bought some loans on the primary and secondary market. On the primary market I mostly did small investments in Estonian loans of all verification methods. In case you wonder what happened to the large Bondora+ positions from the trading experiment in my last article. I still have most of these parts and I am happy to report that the loans where I have very many parts are all paying so far. Only one Bondora+ loan I picked up for trading has defaulted. But I only have 3 parts with 90 Euro total invested in this loan. Bondora continues to provide more and more useful data. Yesterday I did my first test with the private data download (it is at Invest > My Investments > Data Export (Beta)). This feature allows investors to do Excel data downloads (e.g. own investment portfolio, future cashflow, or transaction history of own loan parts on the secondary market). Especially the last one is useful; as it simplifies to keep track which parts sold at which markups/discounts and which did not sell. How is your Bondora portfolio doing? Share your review in the forum. I’ve been following Wiseclerk updates since nearly the beginning, and started investing myself at the end of july 2013. As Wiseclerks himself writes, I think it’s interesting that everyone on the forum shares its own experience on isePankur/Bondora. 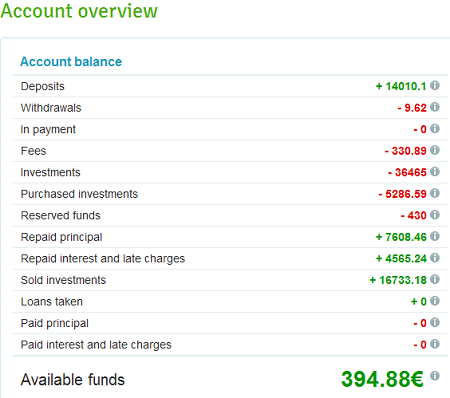 Untill now I’ve deposited 605€ only, which were split in a total of 93 investments. 9 of them are +30 overdue, 9 +60 days (7 of which are consided defaulted). Among my defaulted ones, none has been repaid yet. I’ve had a ROI of 22-23% for most time, but it’s gone down to 20.7% during last months. I’ve been using portfolio manager since beginning trying different settings: from all credit categories, A-C 600-1000, to a more conservative A-C 1000. At the moment I’m running 4 portfoliio, one for each country: the estonian one is the only with a maximum offer set to 10€, the others to 5. Moreovere I trust a “income verified” verifying method on for Esthoni, while “income+expenses” for Finnish, Spanish and Slovenian. Loan terms are all set 18-48. 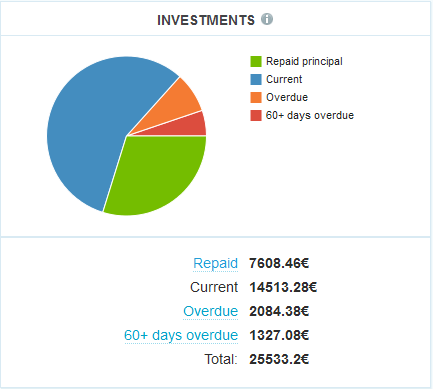 Going back to money… I have 217€ principal repaid loans, 139€ interests, 69€ sold investments, all reinvested (total of 1030€ in investments) and no withdrawable money right now. I do not use Bondora+, I do not buy on secondary market, I now try to sell all my +30days as soon as possible, unlike to the past. I consider my overall experience as really positive. 1. I feel that there are more and more investments on loan consolidation. Don’t you think this can be a chain driving to much more defaulted loans? 2. Looking to Spain, other p2p services like Zank offer lower interests rates. This is why I do not trust that much Spanish on Bondora, do you? 3. I have now some more money to invest? How many weeks do you think it can takes to split 3k in 5/10€ investments? Yes there seem to be much more rescheduled loans than in the past. Whether this is good or bad remains to be seen. I concentrated my investments on Bondora pretty much on Estonian loans for reasons described in my past blog posts. It might take a while, depending on what you set your portfolio manager at and what you bid manually at. I currently have repayments of 700-800 Euro each month and get them reinvested, so it should be possible to invest 3K in 4 month without much effort. Faster if you are investing broader than me. Unfortunately I haven’t received yet the forum subscription confirmation, so I have to write here. I was looking at secondary market and there are some values in parenthesis and some other not. Those in parenthesis are the sum already paid, while I can’t understand what is not in parenthesis regarding Principal Repaid, Repaid interest and total repaid.